The novel “Chasing the Phoenix” by Michael Swanwick was published for the first time in 2015. It’s part of the Darger and Surplus series. Sir Blackthorpe Ravenscairn de Plus Precieux said Surplus arrived in the Chinese city of Brocade bringing with him the body of his friend Aubrey Darger in search of the Infallible Physician, the only one who can make him come back to life. Assisted by Capable Servant, whom he met in the city, he succeeds in its intent but their arrival has attracted the attention of the Hidden King, the ruler of that region. Taken before the Hidden King, Darger and Surplus use their subterfuge to be accepted as his advisers, becoming the Perfect Strategist and the Noble Dog Warrior. Seconds only to Powerful Locomotive and White Squall, they use every trick they can think of to ingratiate themselves with the sovereign helping him to conquer the surrounding kingdoms. Their main problem seems to come from the romantic complications that develop in the royal enturage. In 2001 Michael Swanwick published the short story “The Dog Said Bow-Wow”, Hugo Award winner, which introduced Darger and Surplus, two con men who act in what was called a post-Utopia future as it follows a period of high technological development considered utopian that ended because of a war fought between humans and artificial intelligences. Surplus is a product of the biotechnologies still practiced because he’s a genetically modified dog with a body very different from his ancestors’ and an intelligence at human level. 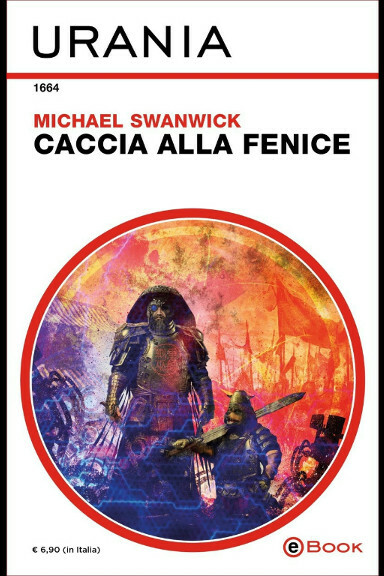 After the first short story, Michael Swanwick wrote more of them set in that post-Utopia future and in 2011 he published his first Darger and Surplus novel “Dancing with Bears“, in which the author greatly expanded his world-building and in particular of the future Russia. “Chasing the Phoenix” is the second novel in the series, in which Swanwick imagines post-Utopia China. The various works are autonomous. In this new adventure, Darger and Surplus are pursuing another of their scams, in this case in post-Utopia China posing as two immortals who want to help the sovereign of one of the regions in which it’s fragmented to reunify it. The China of that future reminds of the past one and Darger becomes a new Sun Tzu but his strategies are not based so much on cunning as on deception and subterfuge. Michael Swanwick took various inspirations from traditional sources regarding Sun Tzu, sometimes mentioning him openly and in other cases adapting some anecdotes to the protagonists of “Chasing the Phoenix”. Technically this can be considered a war novel but there are very few battles because Darger, in his role as Perfect Strategist, tries to defeat the Hidden King’s enemies in less bloody and faster ways. When this isn’t possible, the ancient weapons found by the royal archaeologist White Squall can offer some help. In the end, the tone of “Chasing the Phoenix” is mostly comedic and is more pronounced than in “Dancing With Bears”. Darger seems in some ways the parody of Sun Tzu but the surreal side of the novel comes from the romantic complications due to the infatuations of some people close to the Hidden King, who ask Darger for help. One of the anecdotes about Sun Tzu concern his ability to apply his strategies to women as well by demonstrating it to the king of Wu with his concubines. Darger doesn’t seem as comfortable, especially when he has to satisfy incompatible requests. Michael Swanwick modified the anecdote attributing it to Shrewd Fox with the sons of the ruler of the Land South of the Clouds, told at the beginning of chapter 14. Michael Swanwick seems to have taken something from “Dune” too. The faux anecdotes and sayings at the beginning of each chapter could only be a coincidence but in the novel there are face dancers. Anecdotes and sayings contain not only references to Sun Tzu and some may sound familiar to readers for other reasons more related to the humorous element of “Chasing the Phoenix”. The whole Darger and Surplus series is full of humor and irony, in the case of “Chasing the Phoenix” the story has a lighthearted tone despite the war theme and the occasional presence of demons, the artificial intelligences that survived the war that ended Utopia. From the names of the Chinese characters to the romantic plots, everything is told with surreal and over the top tones in a story in which everyone seems to try to manipulate everyone and only some characters realize they’re being used in someone else’s agenda. “Chasing the Phoenix” is a novel sophisticated in its simplicity that entertains with the funny elements that Michael Swanwick put in abundance in the story. The Darger and Surplus series’ works are autonomous so if you like science fiction comedies, I recommend reading it. Thanks for pointing this title out!